Geometry Wars: Retro Evolved Mobile is the Xbox Live Arcade's smash hit faithfully brought to mobile devices. 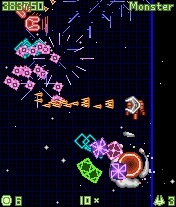 A modern arcade-style game in the spirit of Robotron: 2084, Asteroids, and Tempest, the player controls a "ship" that must annihilate an onslaught of circles, squares, and diamonds. This is the most intense action ever created for cell phones - deep gameplay and simple pick-up-and-play controls combine for the ideal mobile game experience. Geometry Wars: Retro Evolved Mobile brings gamers the addictive action of the original, anywhere and anytime. - In the farthest reaches of the galaxy, evil shapes await. The circles, squares, and diamonds are out to get you - destroy them all! - New features such as numerous Challenge Modes (such as Untouchable, Survivor, and Points Monster), where players will try to reach a defined objective. The player can post his best times or scores for each challenge on a local challenge list and a network leader board." Click the screenshot above for the complete first batch of screenshots.